Flat Velvet & Flat Glossy Lipstick is a flat stick type lip product that provides delicate, defining finish with flat shaped stick which prevents colors from feathering or bleeding. Highly pigmented formula delivers brilliant look of color to your lips. 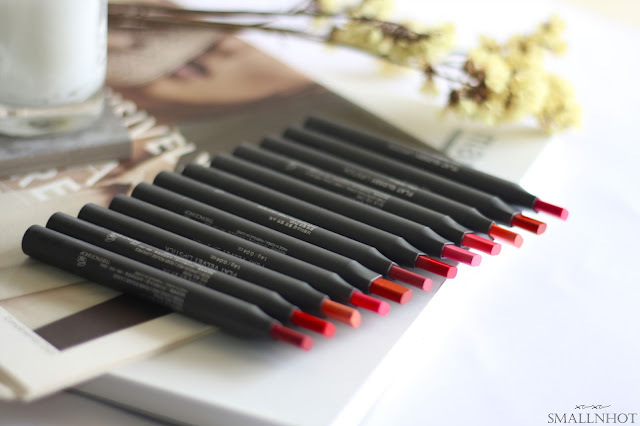 You'll LIKE it for the incredibly pigmented color payoff and how easily it glides on the lips. 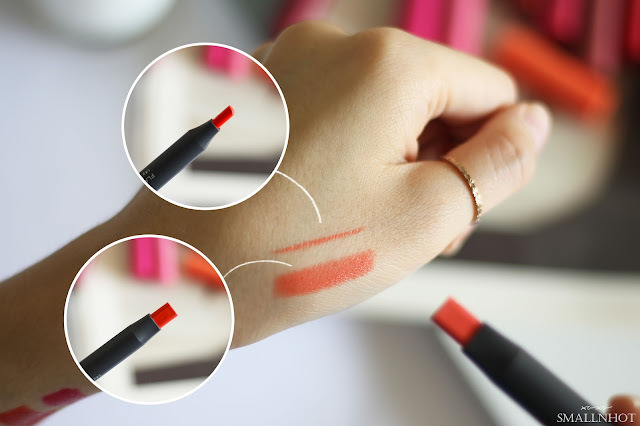 You'll HATE that it doesn't check the long-lasting box and also it gets a bit messy to maintain the flat shape of the lipstick to be used as a lip liner. 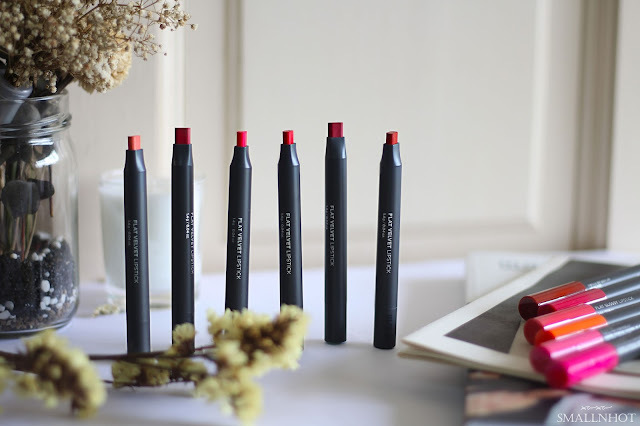 THE FACE SHOP's new Flat Lipstick has decent color selection, from beige nudes to the deep berry reds. And it comes with two different finishing which is the Flat Velvet and Flat Glossy. By the name of it, I would eventually veer towards the Flat Velvet finish because I am not a fan of gloss, but as I swatch it on my hand, I have just converted. 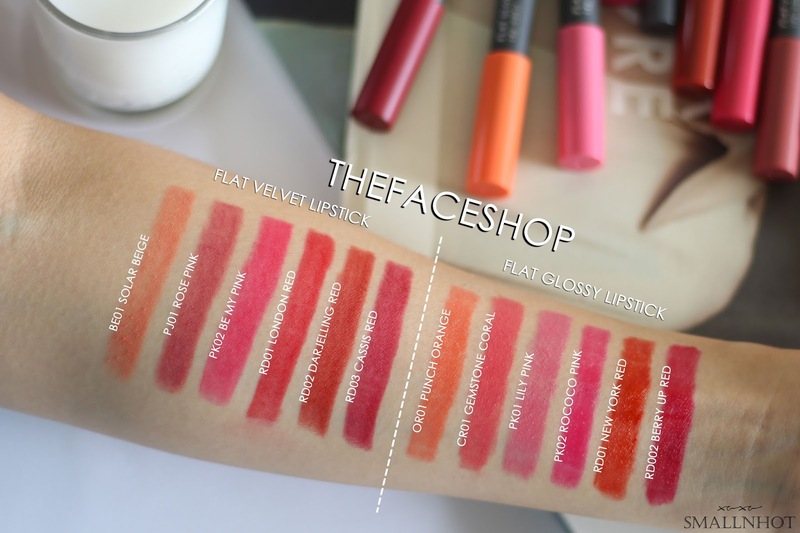 The Flat Glossy lipstick has a much more creamier and pigmented formula as compared to the Flat Velvet lipstick. 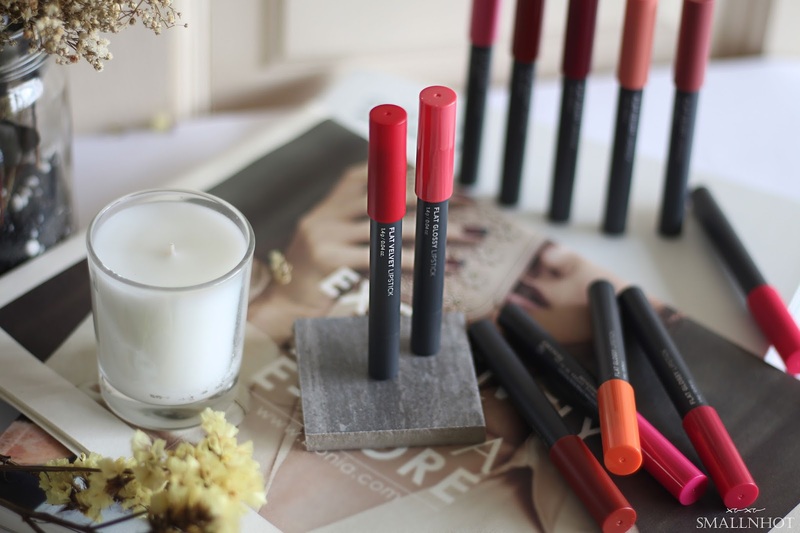 Don't get me wrong, both are highly pigmented but because of the slight glossy finish, it glides on the lips much more easier and has the plumped lip look after applying it. Each of the colors are very wearable for a variety of occasions and suitable for all skin tones (swatches as above). The pinks of Rose Pink, Be My Pink, Lily Pink and Rococo Pink are pretty, and not too bright or brash. London Red is the most gorgeous bright true red and if you want a hint of coral to your red, New York Red will do the job. And for that everyday look, Solar Beige, which mixes a blend of nudes and browns.